Providigm Announces Second Quarter 2014 QAPI Accredited Nursing Centers. The program, now in its second year, has recognized nursing centers in all 50 states. This growth is reflective of the increased commitment of elder care providers across the country to improve the quality of life and care by using data-driven monitoring and evaluation. Providigm, which conducts the nation’s only nursing home accreditation program based on Quality Assurance and Performance Improvement (QAPI), has announced nursing centers accredited in the second quarter of 2014. “Hospitals, physicians, and families can trust that nursing centers meeting these evidence-based QAPI standards are committed to providing the highest quality of care for their residents,” according to Dr. Andrew Kramer, a national leader in quality of post-acute and long-term care. A total of 1,351 nursing centers are currently accredited. With newly accredited nursing centers in the states of Alaska and South Dakota, Providigm’s QAPI Accreditation program now boasts centers in all 50 states and Ontario, Canada. These facilities have conducted sufficient levels of QAPI activity between July 1, 2013 and June 30, 2014, meeting measurable QAPI standards for comprehensiveness, continuity, coverage, and corrective actions. An additional 239 nursing centers are provisionally accredited, meaning they met three of the four standards. Meeting these standards was found to be associated with a substantial reduction in both numbers of deficiencies and Civil Money Penalties in a national research study conducted from 2010 to 2012. Providigm’s accreditation program has a rolling eligibility period; each quarter, additional facilities are evaluated based on the prior four-quarter performance, and those meeting the criteria receive the accreditation. In the eighteen months since the accreditation program began, the number of accredited nursing centers has more than doubled, growing an average of 18% each quarter. This growth is reflective of the increased commitment of elder care providers across the country to improve the quality of life and care by using data-driven monitoring and evaluation. 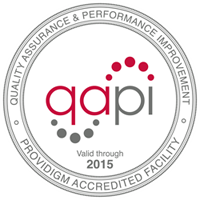 For the complete list of QAPI accredited facilities, listed by state, visit Providigm’s website at http://www.providigm.com/recognition. Providigm creates quality improvement solutions for health care. Through Providigm’s web-based systems and comprehensive training, providers are able to improve the quality of care and life of their residents. Providigm’s patented abaqis® Quality Management System is the nation’s leading assessment and reporting system based on the Quality Indicator Survey (QIS) by the Centers for Medicare & Medicaid Services (CMS). With its recent expansion in QAPI, Hospital Readmissions, and Customer Satisfaction, abaqis goes far beyond survey readiness. Providigm’s accomplished Research Team provides the scientific foundation and cutting-edge methodology behind its quality systems.